Ever wonder what rings exist in RuneScape? This guide will give an overview of each ring in the RuneScape world, including how to obtain each one and what each one does. 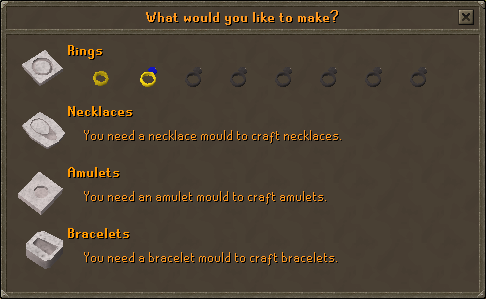 Just choose whichever ring you want to make and your character will craft one. Rare drop by Otherworldly Beings. Bought from Port Sarim Jewelry Shop. Dragonstone 55 Yes Player Made. Onyx 67 Yes Player Made. Members have the ability to "infuse" any unenchanted, crafted rings by exchanging their Mobilising Armies points for an infusement. Infused rings in this category will offer a defensive bonus and/or offensive bonus. Enchanted rings cannot be infused. Note: The examine description for all craftable rings is "A valuable ring." All enchanted rings are Members-Only. They can only be obtained by enchanting them, and they are all tradeable. Note: The examine description for all enchanted rings is "An enchanted ring." None of these quest rings are tradeable and can only be obtained from certain quests. Beacon Ring This ring is given to you by Zaff during the What Lies Below quest, and is used to teleport him into the Varrock Palace. Ring of Visibility Speak to Rasolo to get one. Used in the Desert Treasure quest. Allows the wearer to enter Damis' lair. Ring of Charos Obtained in the Creature of Fenkenstrain quest. Needed for the Garden of Tranquillity quest and is used to get into the Werewolf Agility Course. Ring Of Charos (a) Used in the Garden of Tranquillity quest. Is used to manipulate minds of NPC for your advantage such as free boat ride to Karamja and other great uses. Lunar Ring Obtained during the Lunar Diplomacy quest. Ring of Fire Obtained during the All Fired Up quest. Ring of Kinship Obtained from the Dungeoneering Tutor. Allows free teleports to Daemonheim; allows the wearer to create Dungeoneering parties; can be customized with Dungeoneering Tokens to provide class bonuses. The Warrior Ring, Seer's Ring, Berserker Ring and Archer's Ring can all be infused using Mobilising Armies points. All infused Rings offer an additional defensive and/or offensive bonuses. The infused Berserker Ring offers 8 Strength points. Warrior Ring Dropped from a level 303 Dagannoth Rex. Gives +4 to Attack & Defence slash bonus. Archer's Ring Dropped from a level 303 Dagannoth Supreme. Gives +4 to Ranged bonus. Berserker Ring Dropped from a level 303 Dagannoth Rex. Gives +4 to Strength bonus. Seers' Ring Dropped from a level 303 Dagannoth Prime. Gives +4 to Magic bonus. Easter Ring Obtained during the Easter 2007 Event. When worn, the wearer will transform into an egg. Explorer's Ring Obtained by completing any part of the Lumbridge Tasks.